BlogHome » Blog » We’re headed to the Men’s and Women’s Final Four. We’re headed to the Men’s and Women’s Final Four. This will be my first Men’s Final Four since 1988. I’m beyond excited! But I’d be remiss not to point out that, this time around, I’ll be watching the games through a different lens. I’m now keenly aware that the coaching carousel is in hyperdrive. Many coaches who didn’t make it to the dance – and some that didn’t go far enough – will find themselves out of a job. Some, who unexpectedly took teams deep into the draw, will have new opportunities, leaving vacancies. 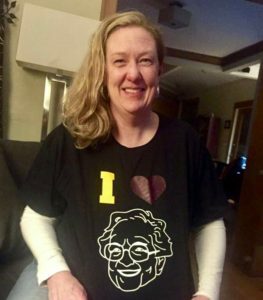 Kathryn sporting her “I love Sister Jean” t-shirt. While my firm has been assisting clients with key hires, it wasn’t until 2016 that I added a Sports Recruiting division to the business. Along with my friend, Tom Jacobs, we founded the Sports division. Tom, who is now the Senior Associate Commissioner/Chief Operating Officer for the Atlantic 10 Conference, will also be in San Antonio. He remains a key advisor to Snodgrass Partners and, as a Kansas grad, he’ll be cheering for the Jayhawks, too. Two of our other Partners – Tom O’Connor, a former AD and NCAA DI Basketball Committee Chair, and Lee Dicklitch, an Assistant AD at Butler University with 17 years of experience in sports management – will join us at the Men’s Final Four. And our Partner, Kathryn Statz, will be representing Snodgrass Partners at the Women’s Final Four in Columbus. She’ll be attending the NCAA BOUNCE event on Saturday afternoon, but plans to be in front of the TV Saturday evening cheering for Loyola-Chicago at the Men’s tournament. Kathryn did her undergrad at Mundelein College, which affiliated with Loyola University Chicago in 1991. She played on the Mundelein women’s basketball team and she knew Sister Jean. Sister Jean was our Vice President. She was, and is, wonderful! She placed a high value on education and using it for the greater good. Since earning her law degree from Marquette University, Kathryn has enjoyed a 25-year career in men’s and women’s collegiate athletics at the campus, conference and NCAA national office levels. The last time I attended the Final Four Kansas’ Danny and the Miracles won it all. What an honor it is for me to be able to say that Tom Jacobs, Tom O’Connor, Lee Dicklitch and Kathryn Statz are a part of the Snodgrass Partners’ team. Together, these outstanding current and former athletic administrators have more than 100 years of tenure in Division I athletics. If you have an opening you are contemplating or intending to announce, you will undoubtedly be deluged with outreach from others in this space. Snodgrass Partners may be relatively new to the athletic search market, but we’ve assembled an all-star team that is poised to focus on your search RIGHT NOW and it will cost you less than you might expect. Contact me to find out how we can identify and recruit the most qualified head coach to lead your program. Step closer to the edge of your comfort zone.